Today on the YarnThing Podcast with Marly Bird: The Kangaroo Dyer Gail Callahan and color grids! Gail Callahan, aka the Kangaroo Dyer, does many things. She started off as a weaver is the 80’s and after her kids went to college Steve Elkin of Webs invited her to work in the shop. After she started working in the retail store, she brought in a blanket that she and her husband bought at a craft fair. Gail asked if they carried the yarn in the shop and they did, but it only came in white, no colors. She wove a few blankets in white and then was talking with Barbara Elkin who suggested that she dye it (and told her she had to learn anyway because she was going to do a demo). Then, Kathy and Steve asked her to try dying some of the Valley Yarn line at Webs and that is how she really got started dying. Since then she has written a book about dying yarn called Hand Dyeing Yarn and Fleece from Storey publishing. She got to write the book by chance. A woman came into Webs with her undyed fleece and said she way scared to dye it. Gail invited her over to her studio and after showing her how to dye, the woman (who was an editor at Storey) suggested she write a book. Like teaching the editor, Gail is able to really show who easy dying can be. It doesn’t have to be difficult. In addition to the book, Gail also recently came out with the Color Grid. The Color Grid is an extension of the color choosing section of the Hand Dyeing book. Gail likens the original color wheel concept as an analog clock and the color grid as a digital clock. The grid seems to make more sense to many people than a color wheel. The grid works by showing how the family’s of color work together. 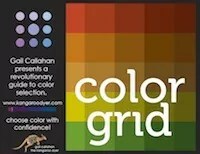 Gail has a nice video on the Color Grid website (link below) that explains how you use the grid. The basic idea is that the colors are laid out in a grid. The large circle on the template is the main color and the smaller circles around it are in the same family and would go well together. The bar is several grid squares away and shows a good complimentary color to the main color family. The Color Grid doesn’t have to be used only for dyeing, it is great for picking out yarn for a project or paint for a painting and many other crafts. In addition to the books, Gail also teaches at Webs and fiber events around the country. She also sells her hand-dyed yarn on her website and on Etsy. Her exclusive Valley Yarn colors are available from Webs. She also does a yarn club that you should be able to sign up for soon (keep a watch on her website). Listen in below to hear everything Marly and Gail talked about today! And we can’t forget the Giveaway!! As always, leave a comment below with Gail’s keyword for your own chance to win a copy of Gail’s book! Great Podcast! Do we call all the people Gale has taught to dye, Joey Dyers? This was so interesting to listen to Gail and hear her talk about dyeing and color. I too get very confused when looking at and trying to figure out the color wheel. I totally could visualize her color grid. This would be something me and my little Joey could do together. (He just got interested in drop spindling.). Thanks for another great podcast and another awesome giveaway! Hi. I thoroughly enjoyed your podcast. I am fortunate that my 3 year old grand Joey, aka Owen, lives less than an hour from Webs where I can admire your beautiful yarns. I already decided that my next purchase there will be Charlemont Aphrodite that I will knit into a shawl. I can’t wait! I am so anxious to play with your color grid and read your colorful book. Gail was a terrific inspiration! Kangaroos and joeys are a great image for the working/crafting moms. Thanks for another great show! Loved the reasoning behind Gail’s choice of the Kangaroo as a symbol of what we mothers do — taking care of our Joeys while doing so many other things at the same time! Now, I’m waiting for the grandkids, so I can again have another little Joey (or Joeys) around the house with me. Great show about working with colors and the dyeing processes — so interesting about how the fibers absorb dyes differently and how to get shine in your fiber! Intriguing podcast, makes me think I\d like to try dying for myself. Very interested in the Kangaroo Dyer Joey sock club, hopefully I will be able to swing the cost for a future shipment. Great podcast. I’ve seen the Kangaroo Dyer on the Webs site and it was cool to hear Gail’s story. I also love her story about her logo and the mama kangaroo with her Joey, and being able to keep her hands free. Another awesome podcast! Dyeing fiber with food colouring is lots of fun, and it’s nice to know it’ll be safe for my friend’s little Joey. You made it sound so easy to dye yarn. Can’t wait to try it with my little grand-Joey! Great podcast. I’d love to learn more about dyeing. It’s hilarious that she refers to her assistant as her joey! Lovely podcast. I loved listening to Gail’s voice and learning the story of the name of the Kangaroo Dyer and her joey(s). She’s an inspiration to no-fear experimentation. I’m still in the joey stage of dying. I’ve taken a class, but we mostly just tried yarn painting with already mixed dye. Still it was fun, but your book would be a great next step. Thank you for the interview with the Kangaroo Dyer. I’m excited to try some color experiments with my “joeys” this summer! It was fun to listen to the podcast. Thank you Marly and Gail! I’d love to explore more in dyeing. I do dye yarn and roving, just for my own projects. Started with CoolAid a few years ago too, though no Joeys were helping me at that time. It is a very addicting hobby! Great podcast!! I’d love to dive into some dying!! I don’t have any “joeys” to help me yet but maybe one will hop into my life in the next year or two ;-). Thank you for the great chance!! Love your podcast, Marly! I can’t wait to teach my two grand- joeys how to dye yarn. Now I’m off to have a look at Kangaroo Dyers yarn and book! Another great podcast! As a knitter and quilter, color has always been the part I struggle with. The color “grid” sounds so usable. I have tried dyeing before on fabric, but it sounds like a good project to try with yarn this summer with my “grand” joeys! Wonderful podcast, as usual. Love the idea of getting rid of the fear of color and just playing. Playing like a joey perhaps?! Can’t wait to give this a try! I have got just the fiber in my stash that has been Joey(ing) out at me ! This was my first time listening to your podcast and I really en-Joey-ed hearing you talk with Gail about how she got started with dyeing! Loved her attitude toward color—going back to the combinations we love as children to take some of the stress out of choosing combinations. The color grid also sounds like a very helpful concept for those of us who don’t “get” the color wheel. I have yearned to try hand dyeing my own yarns for crochet but was too intimidated til now. Gail’s story was very inspiring to this newbie! Love the Color Grid concept. Joeys are so cute! Love dyeing bare yarn. Now I can call myself a Joey dyer! I am as ignorant as a newborn joey when it comes to dying. I look forward to trying my hand at it with the guidance of Gail’s book. Thanks for the wonderful opportunity to learn from her. I have checked out the color grid and love it will buy it soon. Now everytime I go to Atlanta Zoo and see the latest Joey Kangaroo, I will think of dying yarn and needing to buy joey kangaroo yarns! Great podcast. Very interesting. I want to be a joey and be in the kangaroo dyers pocket and learn all the fun things. Loved the podcast. I always have a hard time choosing colors for a new project. I tend to pick the same colors over and over. I would love to play with dye and the color grid that Gail uses. I loved the way Gail refers to all the people she works with as her little joeys. I thinks it’s great that Gail has carried on her Kangaroo through all the incarnations her business has gone through. As a mother of 4 I totally understand the Kangaroo with the Joey in her pouch. As a mom you learn to multitask while holding a child. It was a wonderful podcast. I am just learning to spin and would like to also learn to dye so I can spin a fleece and then dye it. Please let me be your Joey, sitting at your feet learning all you have to share. I remember bottle feeding a Joey when I was much younger. Thanks for a great podcast, it has inspired me to start dyeing. I enjoyed listening to the path an Indi dyer took. I personally am a natural dyer, bad love what you can do with color. We neec to share these ideas with our Joeys (next generation). I enjoy dying yarn with my little Joey with kool aid, I guess I m going to try it with food coloring. Great podcast.